Bobby Moreno as a rooster gearing up for a cockfight, at the Ensemble Studio Theater. “Year of the Rooster” at the Ensemble Studio Theater isn’t merely entertaining. 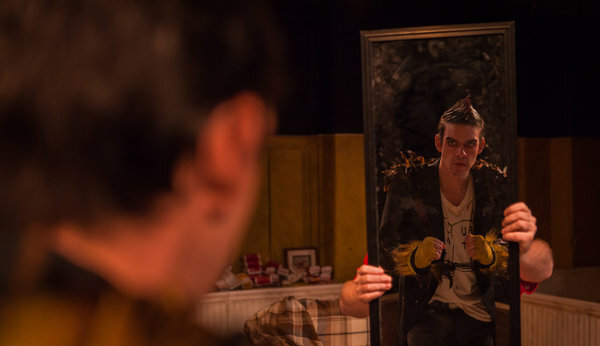 It’s astonishingly entertaining, partly because the playwright, Eric Dufault, is only in his mid-20s and partly because who would have thought that a barnyard bird could make such an intriguing stage character? The play is about cockfighting, and it would be noteworthy just for its human characters: Dickie (Denny Dale Bess), a profane promoter; Gil (Thomas Lyons), a timorous schlub who is training a champion-caliber rooster; Lou (Delphi Harrington), Gil’s aged mother; and Philipa (Megan Tusing), Gil’s foul-mouthed co-worker at McDonald’s. Each of their performances is top-notch, and two of them (Mr. Bess and Ms. Tusing) also do time as fowls. But it’s Bobby Moreno, playing Gil’s prize rooster Odysseus Rex, who makes the play especially memorable. Frenzied and drug-addled (the bird is being supercharged with a diet that includes a lot of injectables), Mr. Moreno is utterly convincing, with the jerky, strutting motions of a rooster and the crowing to match. But this is no gimmick part. Mr. Dufault gives this rooster a complex, conflicted inner life and a revelatory perspective on the world. And Gil piles a lot of hopes onto Odysseus’s feathers. Plot description doesn’t really do justice to this play’s dazzling comic fury, but the gist of it is that Gil enters into a bet with Dickie, who owns a legendary undefeated rooster. The stakes are high; under the humor, Mr. Dufault has laid a foundation of pathos. The pivotal cockfight that ends Act I is exhilarating and, in the tight confines of Ensemble Studio’s theater, a little terrifying. Anyone can stage a sword fight, but the director (John Giampietro) and fight director (Qui Nguyen, of Vampire Cowboys renown) may have invented the template for a battle to the death between birds. It’s a good thing there’s an intermission, because the audience needs time to recover from this scene and get ready for the denouement. Winning, it turns out, isn’t all it’s cracked up to be, whether you’re a human or a rooster. “Year of the Rooster” continues through Nov. 24 at Ensemble Studio Theater, 549 West 52nd Street, Clinton; 866-811-4111, ensemblestudiotheatre.org.